The Light the Dead See collects the best work from those nine volumes and six previously unpublished poems. In the earlier poems, Stanford creates a world where he could keep childhood alive, deny time and mutability, and place a version of himself at the center of great myth and drama. Later, the denial of time and mutability gives way to an obsessive and familiar confrontation with death. 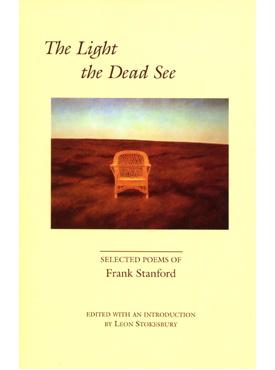 Although Stanford paid an enormous price for his growing familiarity with Death as a presence, the direct address to that presence is a source of much of the striking originality and stunning power in the poetry. Frank Stanford was born August 1, 1948, in Mississippi. He attended Subiaco Academy and The University of Arkansas. After leaving the University of Arkansas in 1971, Stanford married, divorced, and traveled across the country. In 1973, he settled in Eureka Springs, Arkansas, worked as a land surveyor, married the painter Ginny Crouch, and established Lost Roads Press with the poet C.D. Wright. On June 3, 1978, in Fayetteville, he took his own life. Course Description: Critical analysis of significant works of literature, philosophy, visual arts, music and/or film; intensive reading and writing to develop knowledge of analytical techniques in the humanities.